Our readers nominated their favorite subscription boxes, then voted for the boxes they loved most. Here’s what they chose for the Best Men’s Subscription Boxes! Whether you’re looking for a small pick-me-up or a luxury experience, we’ve got the best men’s subscription boxes as voted by YOU in our 2019 Subscription Box Awards. If you need a great gift box subscription for Father’s Day or an upcoming birthday, or are just looking for a great box to try, start here! Our readers nominated boxes across categories such as shaving and grooming, clothing and accessories, geek boxes, sports fan crates, and more! Cost: Starts at $5 per month. Subscribe here! Coupon: Get a starter set for $5 with free shipping! About This Box: Dollar Shave Club tops our list again! Haven’t tried it yet? This razor and grooming supply subscription service features high-quality products at affordable prices. You can choose the frequency of your deliveries, the precise items you want to get, and can cancel at any time. They’ve also added more than just razors and cartridges, so you can stock up on grooming supplies, as well as shower products, hair care, toothpaste, and more. Check out our Dollar Shave Club reviews and Dollar Shave Club details to learn more. Ships to the US, Canada, UK and Australia. Cost: $15 per month. Subscribe here! “Can’t beat the sales, GWPs, Mystery freebie, Ace status and bonus points!” – J. About This Box: Birchbox Man offers a monthly for men that features samples of feel-good grooming and self-care items picked with guys in mind. If you want to upgrade, try Birchbox Man Plus to choose an accessory or lifestyle product to receive each month in addition to your samples. They also regularly offer themed, limited edition non-subscription boxes that include full-sized products and high-end accessories–perfect for gifting or treating yourself. Check out all of our Birchbox Man reviews and our Birchbox Man details for more info. Ships to US. Cost: $19.99 per month. Subscribe here! Coupon: Use coupon code ADDICTION or SAVE3 to save 10% off any length subscription, or $3 off month-to-month! About This Box: Loot Crate delivers the perfect box for the geek in your life who loves all things sci-fi, fantasy, and fandom. Loot Crate curates monthly themed collectibles including toys, pins, apparel and other goodies for fans. You can expect boxes to have a $45+ value, and most items are exclusive to Loot Crate. You can also check out Loot Crate’s fandom-specific boxes, including boxes for Sanrio, Firefly, Harry Potter, and more. Check out all of our Loot Crate Reviews and our Loot Crate details and learn more. Ships to US, Canada, Australia, UK, and others. Cost: $45 per month. Subscribe here! Coupon: Use coupon code ADDICT25 to save 25% off your first box! “I love giving these boxes as gifts to my favourite male friends and relatives. Their items are unique and always appreciated.” LuAnne D.
About This Box: Bespoke Post is a deluxe subscription box for men (or women) with discerning tastes. Each month, you’ll get to choose a themed box filled with unique items for home, bar, and beyond. Explore awesome new products or choose to skip the month altogether. Check out our Bespoke Post Reviews and our Bespoke Post details to learn more. Ships to US and Canada. The Cost: $29 per month. Subscribe here! Coupon: Use coupon code MSA5 to save 20% off of your first box! About This Box: Gentleman’s Box classic provides a monthly subscription “providing the essential elements suited for today’s gentleman.” Boxes typically include wearable accessories (think ties, socks, and pocket squares,) as well as grooming product samples. You’ll receive a custom box and 4 to 6 hand-selected accessories. Subscriptions aim to elevate and unleash the inner gentleman inside every man. Check out our Gentleman’s Box Reviews and our Gentlemen’s Box details to learn more. Ships free to US, and internationally for additional costs. Cost: $28 per month. Subscribe here! Coupon: Use coupon code MSABOX25 to save 25% off your first month! About This Box: SprezzaBox offers a fashion forward accessory subscription for men. Each month they’ll send you 4 to 6 dapper lifestyle and grooming products, and accessories such as ties, socks, and pocket squares. Selections have a total retail value of over $100! Check out all of our SprezzaBox reviews and our SprezzaBox details to learn more. Ships free to US, $6 to Canada, and internationally for additional costs. Cost: Starts at $59 per box. Subscribe here! About This Box: You purchase Fanchest sports team focused boxes a la carte, making them perfect for gifting or gearing up for upcoming tailgates. New boxes release every 3 months, and come filled with season-ready fan gear, apparel, and other officially licensed merchandise. Boxes contain exclusive items, and also a “Golden Ticket,” which gives you a chance to win signed memorabilia and other prizes. Fanchest offers boxes for NFL, NHL, NBA, MLB, and even college teams– check their site for current team availability. Check our out Fanchest reviews and our Fanchest details to learn more. Ships to US. Cost: $25 styling fee, applies toward the price of any items you decide to keep. Subscribe here! 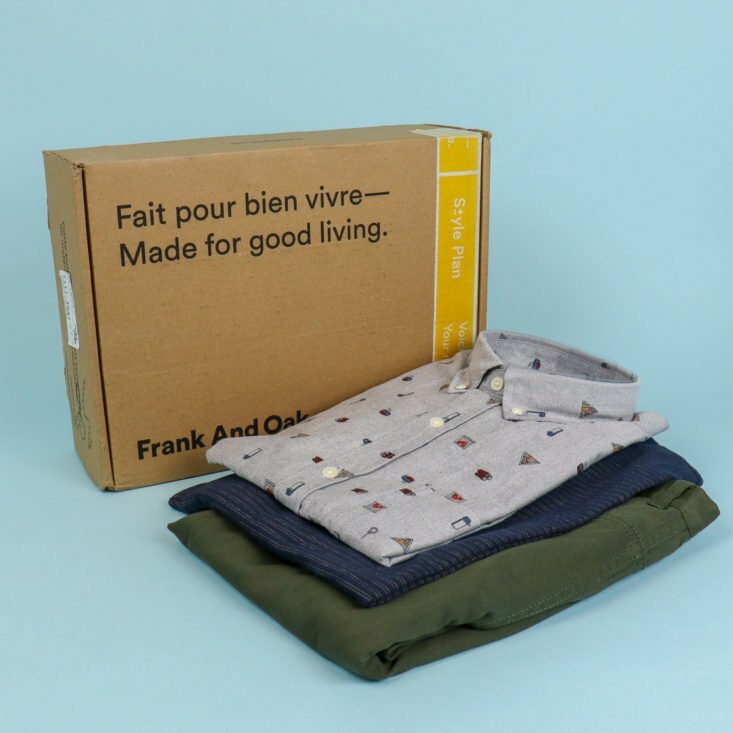 About This Box: Frank And Oak Style Plan for Men offers personal styling from the popular Canadian brand known for its eco-conscious, on-trend modern clothing. Customize based on your preferences, preview orders in advance, and skip shipments as needed. You can choose up to 3 pieces per month, or let Frank and Oak pick for you. Regardless, you’re bound to be impressed by the quality of these versatile pieces! Sign up to for Frank And Oak Style Plan for Men reviews and check out our Frank And Oak Style Plan for Men details to learn more. Ships to US, Canada, and internationally. Cost: Starts at $15. Subscribe here! Coupon: Get a starter set for $8 with free shipping! About This Box: Harry’s razors hail from one of the best blade factories in the world. The Harry’s subscription will send you affordable, high-quality shaving & grooming supplies designed to embrace and enhance the masculine experience. Starter sets include one razor, German-engineered blade cartridges, shave gel, and a travel cover. You can also add skin care products and accessories. You may have recently seen this brand in-store at Target, too! They also donate a portion of proceeds to support mental health care for men. Check our out Harry’s reviews and our Harry’s details to learn more. Ships to US and Canada. Cost: Starts at $99 per month. Subscribe here! About This Box: Robb Vices delivers a themed selection of luxury products designed to inspire and enrapture. You can expect luxurious “vices” like wine and spirits, artisanal foods, unique tools and gadgets, and other goods with a posh flair. It’s the perfect box to wow the man who has everything! Check out our Robb Vices Reviews and Robb Vices details to learn more. Ships to all states, except ND and UT due to alcohol content. Cost: $20 styling fee, applies toward the price of any items you decide to keep. Subscribe here! About This Box: Take the Stitch Fix survey to share your personal style, sizing, and various preferences, and stylist will hand-pick five items for you to try on at home. It’s that easy! You keep and purchase what you like, and return the rest for free. If you’re not a fan of shopping, you’ll love how this convenient service amps up your fashion game. Check out all of our Stitch Fix Men reviews and our Stitch Fix Men details to learn more. Ships to US. Cost: Starts at $129 per quarter. Subscribe here! About This Box: Breo Box surprises and delights subscribers with its cool selection of tech and lifestyle products. This high-end quarterly subscription arrives boxed in a reusable wooden crate filled with 5 to 8 items that fit the season. You can expect brand name products curated around lifestyle, fitness and tech. Past boxes have included items like Bluetooth earbuds, an Instax Mini camera, and even an Amazon Echo Dot! You’ll also love their reward and ambassador programs that offer you discounts, perks, and credits. Check out all of our Breo Box reviews and our Breo Box details to learn more. Ships to US. Cost: Starts at $29 per month. Subscribe here! Coupon: Save $10 off any box! About This Box: Watch Gang delivers a new watch each month that’s valued at up to 5 times your subscription fee. You give your preferences, and Watch Gang promises to surprise you with a style you’ll love. The Watch Gang Black option ($99 per month), sends watches from well-known and premium micro-brands. Watch Gang also offers daily giveaways and the chance to win a Rolex! If wrist bling is your thing, Watch Gang is the can’t-miss box for you. Check out all of our Watch Gang reviews and our Watch Gang details to learn more. Ships to US, and internationally. Cost: $16 per month. Subscribe here! Coupon: Use coupon code MSA50 for 50% off your first month! About This Box: Society Socks is one of our reader’s favorite subscriptions because it makes such a great gift for hard-to-buy-for guys. Every month, subscribers receive two quality pairs of funky (but still office-appropriate!) socks. Socks are well-crafted and designed to inspire. Best of all, Society Socks has a charitable giving program. With every 2 pairs of socks sent to you, two pairs are donated to youth shelters and other communities in need. Check out all of our Society Socks reviews and Society Socks details to learn more. Ships to free to US, and internationally. Coupon: Use coupon code MSA50 to get 50% off your first box! About This Box: Basic Man provides an awesome “essentials” subscription for keeping your underwear wardrobe up-to-date and stylish. You’ll get a new t-shirt, a pair of socks, and a pair of underwear in each shipment. Every month offers new color options in high-quality fabrics. For extra convenience, items come marked with a ‘Destroy By’ date to remind you when it’s time to recycle worn-out undies. Men who appreciate (or who need) reminders, will love this easy, user-friendly subscription. Check out our Basic Man Reviews and our Basic Man details to learn more. Ships free to US, and internationally with varied costs. Cost: Starts at $24.99 per month. Subscribe here! About This Box: BattlBox delivers awesome survival and tactical gear that’s perfect for the quintessential great outdoorsman. Monthly themes focus on preparedness and survival, and include products, gear, and tools related to camping, hiking, “bushcraft,” and outdoor living. Choose the subscription that matches your needs and level of tactical expertise. This subscription box makes for some seriously happy campers! Check out our BattlBox Reviews and our BattlBox details to learn more. Ships to US. That wraps up the list of 2019 Subscription Box Award Winners for Best Subscription Boxes for Men! What are your favorite monthly boxes for men? Sorry about that! We’ve updated this post with the most up to date coupon for Basic Man.